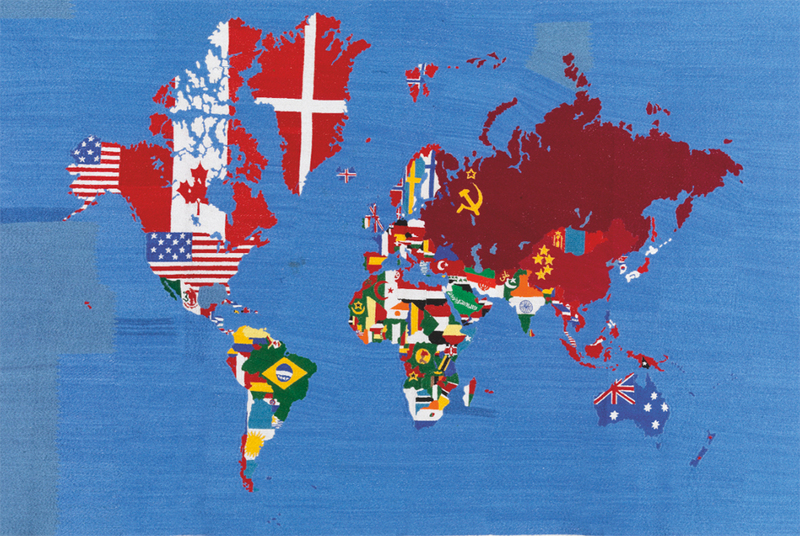 Alighiero Boetti, Mappa, 1979 Broderie sur tissu, 98 x 164 cm, courtesy Tornabuoni Art. Beneath the glass dome of the Grand Palais, Tornabuoni Art will present their works, along with the works of other must-see artists in the international art market lineup, such as Jean-Michel Basquiat and Dubuffet. To be seen at stand no. E30. In so doing, he gives life to the canvas, gives it a rhythm and force. In 2010, Tornabuoni Art made one of the biggest sales of the FIAC with a monochrome by Lucio Fontana, a Spatial Concept from 1966, which sold for 2 million. Tornabuoni Art also presents the works of another historical figure in contemporary Italian art, Alighiero Boetti (1940-1994), at the FIAC. In the spring of 2010, the gallery had honoured him with a masterful exposition, hailed by more than 4000 international visitors, including institutional visitors. And so, cuncurrently with the FIAC, Tornabuoni Art is happy to lend out works by Boetti for the major retrospective starting in October at the Reina Sofia Museum in Madrid (from 5 October to 12 February 2012). This travelling retrospective will then be featured at the Tate in London and the New York MoMA. Moreover, Boetti's works are highly sought after by auction houses. In June 2010, Christies set a record with the sale of a 1989 Mappa for £1,833,250. As a major protagonist in Arte Povera (he participated in the founding exhibition of this movement in 1967) and Conceptual Art, Boetti has deeply pondered the artist's role. At stand E30 one can see his notorious "Mappa", a series of works which he started in 1971 and continued until the end of his life. These embroidered planispheres, of quasi historical value, portray the flags of countries at a given time in the history of the world's nations. Through these world maps, Boetti bears witness to his concerned focus on the world and its geopolitical (dis)order, while establishing a link between art and craft. Indeed, he had these tapestry pieces made by Afghan, and later Pakistani, women. A major retrospective dedicated to Enrico Castellani at Tornabuoni Art gallery. From 14 October to 17 December 2011, the Tornabuoni Art gallery will show a masterful retrospective devoted to Enrico Castellani through some 45 works of art. Known for his monochromatic embossed canvasses, Castellani (born in 1930) is a major Italian figure associated with the ZERO movement who, by rejuvenating the language of image and form, greatly contributed to the development of avant-garde artists in Europe in the 1950s and 1960s. Donald Judd saw him as the father of minimalism.